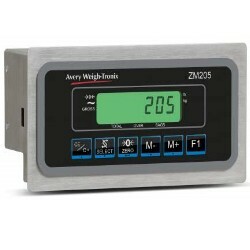 The Avery Weigh-Tronix ZM205 baggage weighing indicator has been designed specifically for fast and accurate operation at busy airport check in desks. The combination of a simple to use operator interface and straightforward passenger display keeps check in time to a minimum. The operator display is designed with simplicity and functionality in mind, featuring five operational keys that fulfil common requirements with minimal button presses. The easy to read passenger display delivers improved customer service by providing a straightforward, easy to interpret indication of baggage weights. The ZM205 features two serial RS232 ports for data transfer to peripherals such as printers or PCs. Passenger and operator indicators are connected via robust Ethernet technology, ensuring uninterrupted communications. The ZM205 operator indicator can be fitted with an optional Profibus or Relay Control kit which can interface with a baggage conveyor system to automate the movement of the conveyor.